It was my Tuesday Chatterbooks group today, and I’m pleased to announce that it went stunningly well. After last month’s slump, I was concerned that the group was moribund before it had even had a chance to get started. This had been, to be fair, largely down to the extended closure of the library and some confusion of dates leading to crossed wires. To try and head things off, I erred on the side of caution in how I kept in touch with the parents, and plastered posters and signs everywhere. I was expecting eight children in all, and this time got twelve. How? well by creating a word search for the children to do while we waited for everyone to arrive. The group meets immediately after school, so other children in the area got interested and asked to join in. The word searches contained the names of all the regular attendees, and some key words about the group. Its an idea I got from a recent gathering of Surrey Libraries Chatterbooks organisers, and it was great to see them working together to find everything, excited to see their names in it. After that we talked about favourite characters in books read recently, describing them as friends we were telling each other about. We wrote up the books they’ve read this month, and made more decorations for the Chatterbooks tree, consisting of details of favourite books described in five words. We even got three of the extra children signed up for future sessions, so I’ll be doing something like that for future sessions too. All in all, a very rewarding afternoon..! 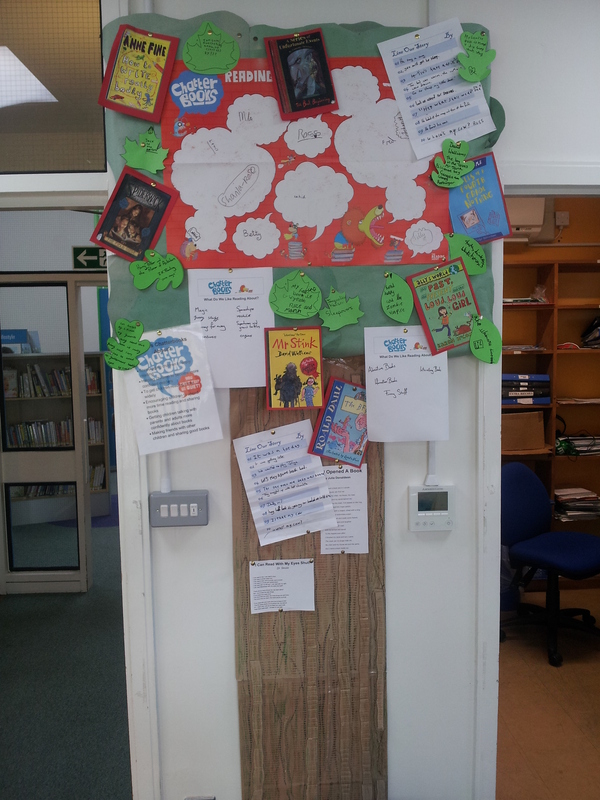 This entry was posted in events, work and tagged 23things, Chatterbooks, library, Reading. Bookmark the permalink.